Fantasy Faire 2016: blogger applications are open! Fantasy Faire, the largest fantasy-related event to take place in Second Life, opens its portals on Thursday, April 21st and runs through until Sunday May 1st inclusive. It will bring together everyone with a love of fantasy – enthusiasts, creators, performers and designers – for eleven days of commerce, special events, live music concerts and more, all to help raise funds for Relay for Life of Second Life. Every year we welcome almost a hundred bloggers into the early access to the Fairelands, to photograph and capture their beauty when they are still pristine and free from the Lag Monster. This year is no exception. Those applying to be an official blogger at this year’s faire can also apply to write for the official Fantasy Faire website. This has no influence on the actual blogger application and should be filled only if you are truly interested. There’s very limited spots for this. For full information on applying to be an official 2016 Fantasy Faire blogger, please refer to the Blogger Info 2016 page on the official website, and then complete the application form. It may be so far away that the Sun appears to be a particularly bright star it is sky, but it now seems that Pluto has a liquid ocean just beneath its icy surface, just as might have once been the case with its companion, Charon, billions of years ago. Since passing through the Pluto-Charon system in July 2015, NASA’s New Horizons space craft has been returning the data it gathered at a steady rate, focusing initially on the high-resolution images collected during the probes high-speed run by the two tiny worlds (both smaller than the Moon). 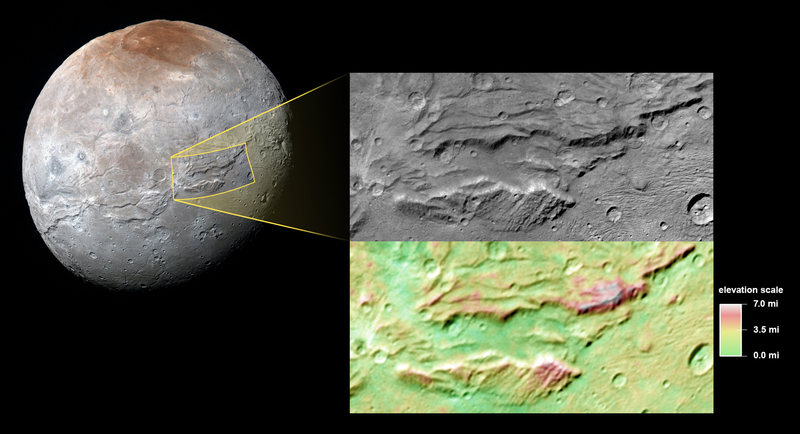 These images have revealed Pluto and Charon to be remarkably complex little worlds, with glacial flows, rotated ice blocks, volcano-like mounds and other features rivalling the geology found on much larger, warmer planets like Mars. “What we see really has exceeded all of our collective expectations and imagination,” said William McKinnon, a planetary scientist at Washington University, Missouri, and one of those working on the project. “We think on the insides of these bodies were very cold ammonia rich oceans,” said McKinnon, noting that ammonia is a “fantastic antifreeze” that can lower the freezing point of water by 100 C.
Data from New Horizons indicate that Charon’s ocean probably froze solid around 2 billion years ago, expanding as it did so, cracking open the outer shell of the world. This freezing-out was likely due to Charon being too small to remain geologically active, its internal processes quickly slowing down as it cooled. Pluto, however, being larger, shows every sign of still being active and with a warm interior, so its subsurface ocean probably still exists, marking it as another in a handful of the solar system’s smaller bodies which are home to sub-surface oceans. “We now have half a dozen worlds, like Enceladus (a moon orbiting Saturn), Europa and Ganymede (moons of Jupiter), and now Pluto, that seem to have oceans in their interiors,” New Horizons’ lead scientist Alan Stern said when discussing the potential and significance of Pluto’s ocean. We know that life is remarkably tenacious and is extraordinary for surviving in unlikely places. All that is required is heat, a source of energy and water. 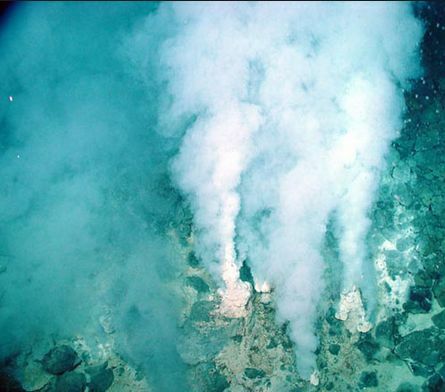 On Earth, for example, volcanic fumeroles on the deep ocean floor can become havens for exotic life in places where sunlight never reaches. This has led to speculation that places like Europa, which generates a lot of internal heat due to gravitational flexing thanks to the presence of Jupiter and the other large Galilean satellites, may well have similar, mineral-rich fumeroles on its ocean floor which may be havens for life exotic, basic forms of life. Could Pluto have the same? “All we can say is that we think that Pluto has an ocean and we think that this ocean has survived to the present day. It’s the kind of ocean that is deep inside the interior of Pluto, in total darkness,” McKinnon stated. Whether or not any basic life has managed to develop deep under Pluto’s icy crust is something we may never discover. However, that a liquid ocean does appear to exist beneath the planet’s icy shell is nevertheless intriguing. That water is present on Pluto has already been confirmed by the Ralph instrument suite aboard New Horizons. 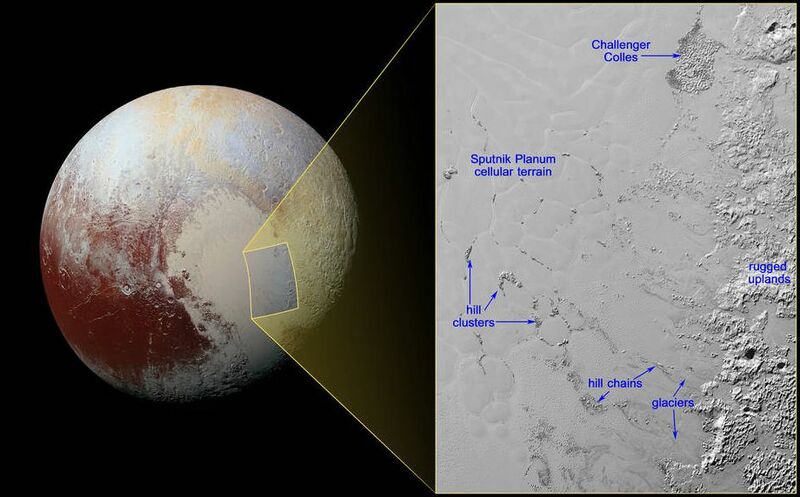 However, further evidence of its existence was revealed in February with the publication of images of “floating” hills of water ice on the nitrogen ice “sea” of Sputnik Planum”. These hills are thought to be fragments which have broken away from the uplands surrounding “Sputnik Planum”. They exist in chains multiple kilometres in length or are grouped together, standing in stark contrast to the relatively flat expanse of the icy plain on which they sit. Because water ice is less dense than nitrogen-dominated ice, scientists believe these water ice hills are like icebergs in Earth’s Arctic Ocean. In particular, the “chains” of hills have formed along the flow paths of the glaciers, while in the more “cellular” terrain of central “Sputnik Planum”, they become subject to the convective motions of the nitrogen ice, and are pushed to the edges of the cells, where the hills form clusters or groups. One of the largest of these, located towards the north of “Sputnik Planum” and measuring some 60km x 35km (37 mi x 22 mi) has been dubbed “Challenger Colles” in memory of the crew of the lost space shuttle Challenger. 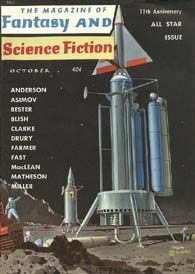 Gyro Muggins concludes a 3-part reading of tales concerning one of Philip José Farmer’s many memorable characters: Father John Carmody, and ex-con who painfully grew a conscience, but is still not entirely beyond benefiting himself. Now, in Prometheus, the egg attached to his chest until such time as it hatches, Carmody finds himself on Feral, the planet of the horowitzes, and cast in the role of educator for these strange birds, and as a sort of latter-day Prometheus, bringing them moral enlightenment. Three entwined stories focusing on a magical harmonica, start with the tale of 12-year-old German boy Friedrich, growing up in the time of the rise of National Socialism in Germany. Already an outcast because of the birthmark that disfigures his face, Friedrich discovers the harmonica, and with it, hope for the future. 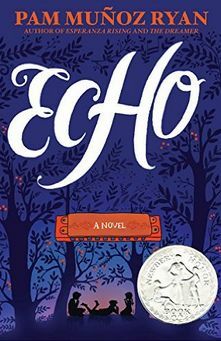 Two years later, 11–year-old Mike Flannery finds himself in possession of the harmonica, and with it, the opportunity to prevent his younger bother being sent away to a state home by the woman who adopted the boys to suit her own purposes. In the final story, Ivy Lopez, whose parents are migrant farm labourers. It’s a year after Pearl Harbour, and her family find themselves running a farm after the Japanese-American owners are placed in an internment camp. Forced to attend “Americanisation” schooling, Ivy encounters institutional racism, and also strength and refuge when the harmonica enters her life. But soon enough, her family’s ties to the Yamamotos put them in crisis, and Ivy finds herself keeping what she fears is a terrible secret. 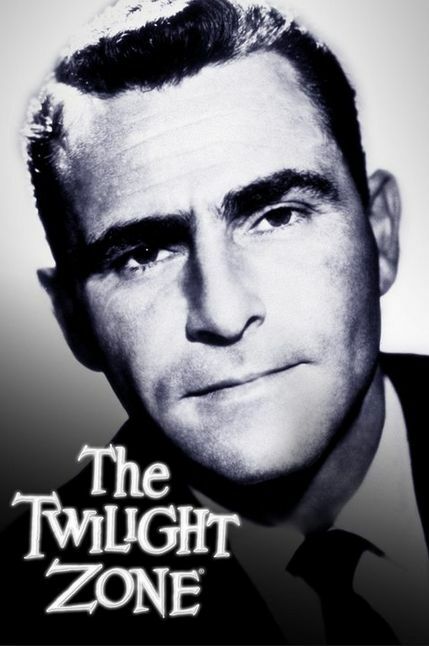 The Lonely is the 7th episode seven of first series of The Twilight Zone, which first aired on November 13th, 1959. James Corry is a man sentenced to solitary confinement on a distant asteroid for 50 years, his only visitors bring the crew of his resupply ship, who arrive at the asteroid four times a year – but stay only for 20 minutes. To try to make Corry’s life a little easier, the captain of the ship delivers a feminine robot to keep him company. 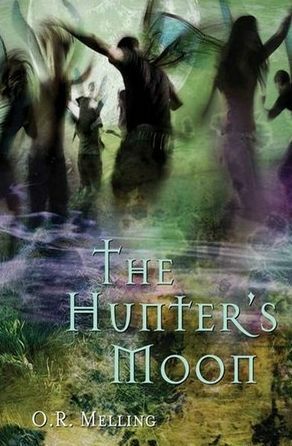 Then the news comes that Corry has been pardoned, and he can return to Earth – but only at a price. Join Caledonia Skytower and Shandon Loring as they enter …. the Twilight Zone.